BARBARA KLEIN: Welcome to THE MAKING OF A NATION - American history in VOA Special English. In our last program, we told you how the flow of immigration to the United States began to change in the eighteen eighties. Before then, most of the immigrants came from central and northern Europe. From Britain, Ireland, Germany and the Scandinavian countries. The largest number came from Britain. They found it easy to settle in a country that, until seventeen seventy-six, was a collection of British colonies. The newcomers from Britain shared the same language with the Americans and many of the same traditions. Some of these early immigrants were skilled workers who found good jobs in American industry. Others were farmers who came to America for free land. This week in our series, Robert Bostic and Jack Weitzel continue the story of immigration in the United States. ROBERT BOSTIC: After eighteen eighty, the flood of immigration from northern and central Europe began to fall. Now, most immigrants were coming from eastern and southern Europe. From Russia, Poland, Romania, Italy, Greece. These new immigrants were different from those who came earlier. Most did not speak English. Most were poor farmers who had few special skills. Most had little or no education. They were, however, good workers. They did not protest working long hours for low pay. They did not demand better working conditions. They usually refused to join labor unions or take part in strikes. JACK WEITZEL: American factory owners were pleased with the new immigrants. They gave them jobs formerly held by higher-paid American workers. The owners asked the new workers to write letters to friends still in the old country, urging them to come to America. And they came by the hundreds of thousands to take jobs in steel factories in Pennsylvania and the coal mines of West Virginia. They worked in the lumber camps of Michigan and in the stockyards and the meat-packing plants of Chicago. American workers then began to protest, as their jobs were filled by immigrants who were happy to work for less money. ROBERT BOSTIC: The protests were especially bitter on the pacific coast where thousands of Chinese immigrants were settling in California. The Chinese arrived there after eighteen fifty to help build western railroads. After the railroads were completed, these Chinese new-comers turned to other jobs. More came every year. By the eighteen seventies, California's political leaders were demanding an end to further immigration from China. 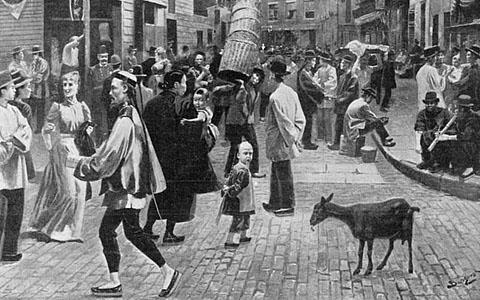 In eighteen eighty-two, Congress passed a law that barred Chinese immigration for ten years. The law was extended for another ten years then made permanent. JACK WEITZEL: The immigration law of eighteen eighty-two put other limits on immigration. It closed the country to criminals, the mentally ill, and persons who could not support themselves. Later, others were added to this list. Persons with diseases. Anarchists. Alcoholics. This, however, did not greatly reduce immigration from eastern and southern Europe. And opponents of immigration demanded stronger action. Some proposed a literacy test. Immigrants would have to show that they could read and write. An immigrant who could not, would not be permitted to enter the country. "If we care for the welfare, the wages, or the standard of life of American workingmen, we should take immediate steps to limit foreign immigration. There is no danger to our working men from the coming of skilled workers or of trained and educated men. But there is a serious danger from the flood of unskilled, ignorant foreign labor. "This labor not only takes lower wages, but accepts a standard of living so low that the American working man cannot compete with it." "A literacy test will bear very lightly, if at all, upon English-speaking immigrants or Germans, Scandinavians and French. The races which would suffer most under a literacy test would be those with which the English-speaking people have never united, and who are most different from the great majority of the people of the United States." Congress passed the proposal. President Cleveland, however, vetoed it. He said the nation had nothing to fear from immigrants who could not read or write. He said there was greater danger from some of the educated immigrants who urged violence and anarchy. It took a number of years before Congress was able to pass a law demanding a literacy test for immigrants. JACK WEITZEL: Another problem troubled President Cleveland. High tariffs -- taxes on imports. Soon after his election, Cleveland decided to learn what he could about the tariff. "I'm sorry to say," said Cleveland, "but the truth is, I know nothing about the tariff." Cleveland studied all the information he could find about the tariff. He found that the tariff was used not only to get money for the government, but to protect American industry from foreign competition. The tariffs had been raised so high that they were producing more money than the government needed. Cleveland decided that high tariffs were wrong. He told other democratic leaders that he would try to get them reduced. The politicians warned him not to try. They said he would only lose the support of businessmen. They said he would need campaign money from business if he expected to be elected president again. But Cleveland rejected their advice. He said, "What is the use of being elected or re-elected, if you don't stand for something." ROBERT BOSTIC: So, late in eighteen eighty-seven, Cleveland sent a tariff message to Congress. He said it was wrong to raise more tax money than the government needed. When this happens, he said, money is withdrawn from the people's use and kept in the public treasury, where it does no good. It threatens the economy and invites dishonest attempts to use the money for private interests. The government, he said, received most of this unnecessary tax money from tariffs. He said the present tariff laws were vicious, unfair, and illogical. He said they raised the prices of all imported goods which could be taxed. They also led American manufacturers to raise their prices as high as those charged for imported goods. Cleveland said some men had become rich, because protective tariffs let them charge high prices. He noted that American businessmen like to talk about the strength and success of American industry. But he said that when the question of the tariff is raised, businessmen claim that industry is weak. They say they cannot compete with low-priced foreign products. JACK WEITZEL: Cleveland said he did not propose that all tariffs be ended. He said some were needed to raise money for the government. And he said some industries could not exist unless they were protected by tariffs. But he said tariffs should not let some industries make huge profits. 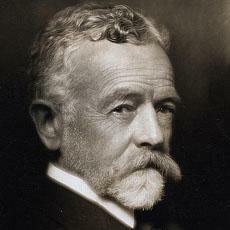 Cleveland warned that it would be far better to make safe, careful, and intelligent changes in the tariff laws now. Otherwise, he said, there might come a time when an angry public would demand radical and sweeping changes. ROBERT BOSTIC: The House of Representatives moved quickly to pass a moderate bill that would reduce many of the tariffs. The legislation -- called the Mills Bill -- was exactly what Cleveland wanted. But the bill ran into trouble in the Senate, where Republicans had control. Senator William Allison, a Republican from Iowa, proposed a different tariff bill. It was one that would increase tariffs...not reduce them. The Senate debated the tariff question for months. And since it was eighteen eighty-eight -- a presidential election year -- the tariff became an important election issue. The Democrats promised low tariffs that would mean lower prices for the people. The Republicans defended high tariffs, which they said were necessary to protect American industry and labor. 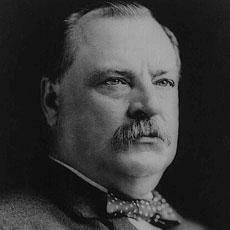 The Democrats nominated Grover Cleveland for another four-year term. The Republicans held their nominating convention two weeks later. BARBARA KLEIN: Our program was written by Frank Beardsley. The narrators were Robert Bostic and Jack Weitzel. You can find our series online with transcripts, MP3s, podcasts and images at www.unsv.com. You can also follow us on Facebook and Twitter at VOA Learning English. Join us again next week for THE MAKING OF A NATION -- an American history series in VOA Special English. more lower tariff mean more lower price for public people.